A big tip 'o' the hat to Chris Atkinson and Louise Booth at Henry's Store 005 in Newmarket Ontario for providing the Skylux for this review. I have six studio flash heads, 4 at 500ws and 2 at 1000ws. Why? When using modifiers, it's better to have enough power to be able to select the aperture you want for the amount of depth of field you want. When it comes to flash, there's no such thing as too much power. Most studio heads have modelling lights that help the photographer position the light to get the style he or she wants. However, I find that sometimes users still struggle. For some subjects, flash can be disconcerting or downright frightening so an alternative is needed. A couple of years back I added Westcott Spiderlites to my arsenal, a TD-5 and a pair of TD-6 units. For soft continuous light they are really nice. The big drawback is that while you can control output by switching banks of lamps on and off, there is no continuous dimming function like you find on professional video lights, and so I've found myself going with my KinoFlos more than not when needing continuous light. 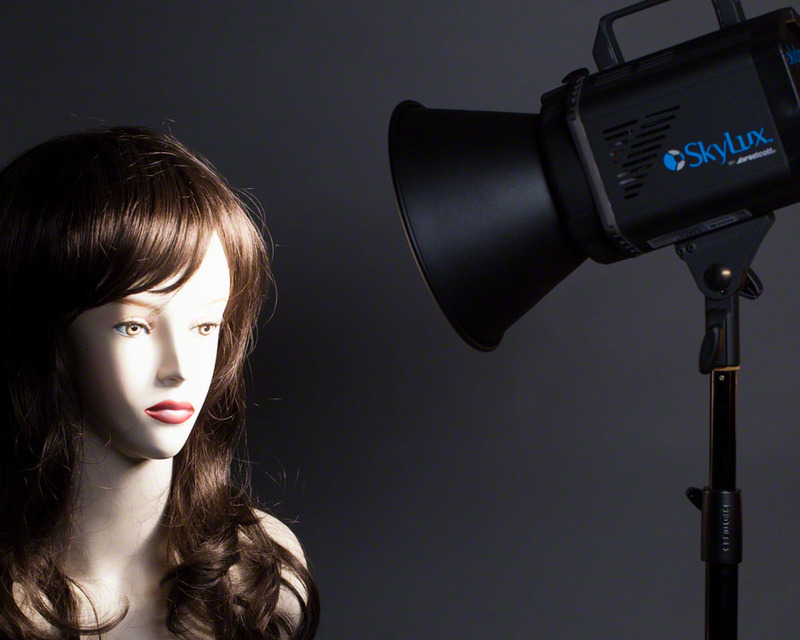 Westcott has stepped up with a continuous light that looks and mounts like a studio flash head. It's a frosted LED lamp head that accepts a variety of standard softboxes and octaboxes using Bowens speed rings. In fact you can buy the head in a kit with Westcott Octas if you so desire. The Skylux is equivalent in output to a 1000 watt photoflood, that you can dial down to 30% output or about a 300w light. The LEDs are colour-balanced to 5600K, equivalent to daylight. LEDs typically run very cool, but the head has a built-in fan that will keep temperatures down. Normally fans are anathema to videographers because of the noise, but this fan is very quiet, not silent as sometimes articulated but still reasonably quiet, so this makes the Skylux good for videography as well as stills. The head is of metal construction as is the tilter bracket, nicer than the plastic used by other vendors. There is a carry / grab handle on top as well. Looking at the unit from the back there is a connection for power, a dimmer for output and an on/off switch. Looking face on, you see the LED arrangement, that is positioned to not cast edge shadows and has a diffusion panel mounted permanently. The ring mount system is easy to use and the light comes with a mid-depth disk reflector so you can direct the light. And I mean direct. Expect harsh shadows from this arrangement. Fortunately, the mount is a Bowens S Mount, so you can take anything that attaches to a Bowens Speedring and attach it directly to the Skylux. Very handy in concept. In execution, it was much more of a struggle. The Bowens speedring fits the mount fine, but turning it to achieve a lock required more force and fuss than it should have. As I was handling a medium sized soft box this was somewhat annoying. I would have to work on this if I owned one, but when I tried the Bowens Maxi-Lite reflector, it connected quickly and correctly. Westcott has been thinking about how people need to work. The power connector is a screw down five pin connector and the cable is about 15' long to where it plugs into the external ballast. The ballast then has a 5' cord to the AC outlet. 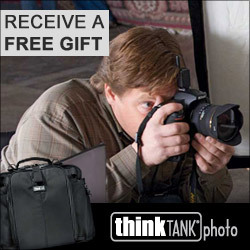 The ballast unit comes in a lightly padded case with a strap so you could hang it on a light stand or hook if you wish. The lamp feels lightweight, the ballast feels like a brick, so separating them makes it much easier to hang the Skylux at the end of a boom arm. This is where that 15' initial power cable comes in handy. In reality the head is heavier than the ballast according to the specs but it just doesn't feel that way. In a couple of the sample shots you can see that the unit is attached to the light stand via a Manfrotto Magic Arm. At the top of the tilter handle, under the lamp housing, is a small recess designed to take an umbrella. I slid a Bowens umbrella into the holder and it worked fine. I would have used my big Westcott but did not have the room for the demo shot. The real question is how does it light? The answer is pretty darn well. I came away impressed and admittedly I was asking myself what kind of desperate person would pay $1200 for a single continuous head. I set up my usual config with the light, some modifiers, a table and my habitual model Sondra. She looks annoyed because the aforementioned soft box detached itself and landed on her part way through the shoot mussing her hair. Exposures are not optimal in the attached shots, mostly because I was trying to balance the light from the Skylux and still show the surroundings. The background is an 18% grey roll, the model lighting is by the Skylux and the room illumination is by my tried and true KinoFlo Tegra 4-Bank. So what's the verdict? I came to the review with plenty of skepticism. Price was the main driver, and in fact I still think that the device is much too expensive for most people. I like the continuous power control, but wish it would go below 30% power. I am guessing Westcott holds it here to maintain colour temperature consistency as you manipulate the power. Turned up full, it's quite bright but it's not going to give you flash head levels of depth of field. Shooting with the 100/2.8 Macro, I was able to get the aperture down to f/5.6 maximum running at 30% power before I would have needed a tripod. That's a good indicator of where you're going to be with this light. Since it is pretty well suited for flash hating children and pets, understand the limited depth of field and remember that you are going to have to get the light in close. My meter readings at full power firing into the umbrella at ISO 400 were 1/40 @ f/5.6 evaluative, with the focus point on Sondra's near eye. This produced a very pleasant exposure but it's hardly action stopping. The inside of the umbrella was about 3' from Sondra at this reading. I like the Skylux very much. I don't like it $1200 worth though. For the same kind of money, you can get a pair of Bowens 400w/s heads with stands and modifiers or the 400w/s Elinchrom D-Lux 4 system. I'm really very excited about the potential for studio head style continuous lighting. If you are doing videography as well as still photography, there is a benefit there if you cannot afford to get into two different lighting systems, or don't have the space for all this stuff. Westcott is funny from a pricing perspective. Their Rapidbox offerings are very price competitive and an excellent value. Their first portable continuous light, the ICElight is dim, expensive, has short battery life and did I mention it was dim AND expensive? The Skylux is absolutely the direction to be looking. If it had a bit more power, a wider dimming range and sold for about $600 with a stand, it would be perfect. As it is, it's a very nice light, easy to use and quite flexible, but priced too high to get real market traction. Specs are below and are courtesy FJ Westcott.